Peter Tillemans (c. 1684 – 5 December 1734) was a Flemish painter, best known for his works on sporting and topographical subjects. Alongside John Wootton and James Seymour, he was one of the founders of the English school of sporting painting. From 1708 until his death he lived and worked in England. Tillemans was born in Antwerp in c. 1684, the son of a diamond-cutter, and studied painting there under various masters. As he was the brother-in-law of another Flemish painter, Pieter Casteels, it is assumed that he married before leaving Antwerp. Like other artists from the Low Countries such as Dirk Maas, Jan Wyck and Willem van de Velde the Younger, Tillemans moved to England. In Tillemans's case he moved in 1708, induced to do so by a picture-dealer called Turner: he spent the rest of his life working there. If we may judge from his success Tillemans was a socially agreeable and charming man. A portrait of him reveals that he was a gentle, friendly-looking fellow, with long curling hair, presumably his own and not a wig, such as was commonly worn by members of the upper and professional classes in the late eighteenth century. A chronic sufferer of asthma, Tillemans retired to Richmond "on account of his ill state of health". He died at the house of Dr Cox Macro (1683–1767, later chaplain to George II) in Little Haugh Hall, in Suffolk, on 5 December 1734 (the previous day he "had been busy on a horse portrait") and was buried on 7 December at Stowlangtoft. His collection of paintings had been sold in an auction conducted by Dr Macro on 19 and 20 April 1733 and included paintings by James Tillemans, probably a son or other relation, and by Arthur Devis, who, like Joseph Francis Nollekens, was one of Tillemans's pupils. Dr Macro had a bust of Tillemans made by John Michael Rysbrack, placing it "in a niche at the top of a staircase in Little Haugh Hall". A portrait of the artist, engraved by T. Chambers, from a painting by Hissings, is given in Fuseli's 1805 revised edition of Rev. Matthew Pilkington's A Dictionary of Painters. Tillemans was brought to England in 1708 by "Turner, a picture dealer"; his first works were copies of battle scenes made for Turner, particularly of the works of Jacques Courtois, as well as small genre pictures. He enjoyed much success imitating the style and execution of David Teniers. Tillemans worked in many different styles and rarely dated his work. 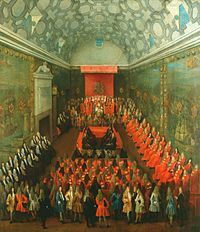 After at first working as a copyist, he quickly made his name, and among his first important commissions in England were two paintings of the interior of the Palace of Westminster, one of Queen Anne in the House of Lords (1708–14), the other of the House of Commons in session (c. 1710). By 1711 Tillemans joined Godfrey Kneller's Academy of Painting and Drawing in Great Queen Street, London, stating his speciality as "landskip". His main residence was in Westminster but he travelled extensively on commission. Dr Cox Macro, his most faithful patron and the one for whom his work is best documented, gave him commissions, including battle and hunting scenes, landscapes, renovation work, and portraits from 1715. In 1716 Tillemans repainted part of a portrait of Dr Macro by Frans van Mieris from around 1703, making alterations to his face. That year he also painted Dr Macro in the background of The Artist's Studio (c. 1716), a self-portrait, with a pupil and Dr Cox Macro, surrounded in the studio by paintings. (He also painted Dr Macro's children in Master Edward and Miss Mary Macro in c. 1733). In 1717, his conversation piece of the royal family making music was shown at the Bartholomew fair. He was commissioned in 1719 by the antiquary John Bridges to "make about 500 drawings for a projected history of Northamptonshire", and some of these were later published in Peter Whalley's History and Antiquities of the County of Northamptonshire (1791). His other patrons included the Duke of Devonshire, the 4th Baron Byron (to whom he was also drawing instructor), and the Duke of Kingston. His "highly accurate" eponymous painting of the Battle of Glen Shiel in the Scottish National Portrait Gallery, painted in the same year as the battle, was originally catalogued as The Battle of Killiecrankie 1689. The greater part of Tillemans's oeuvre was painted from approximately 1720 onwards, and it is from the works painted over these years that he chiefly derives his fame. During the early 1720s, Tillemans moved successfully into the field of painting dogs, horses and racing scenes and was one of the earliest painters of sporting scenes in England; four of these works, "engraved by Claude du Bosc and published in 1723, are among the most spectacular early sporting prints in England". Horse with Groom and Hounds, 1734. Tillemans was working on this unfinished painting on the day before he died. The development of painting on sporting themes was centred on the Newmarket Racecourse in the market town of Newmarket in Suffolk. Together with his friend John Wootton (a pupil of Jan Wyck) and James Seymour, Tillemans was one of the three founders of the English sporting school; their paintings "show the first marriage of the topographical tradition of landscape with a sporting element". Because both Wootton and Tillemans omitted to sign many of their works, some of them are difficult to tell apart. Tillemans's Newmarket: the Long Course (1723) is in the Government Art Collection. Another Newmarket scene, The Newmarket Watering Course and a sporting scene, Three Hounds with Horsemen, a Hunt to the Left, both in Norwich Castle Museum and Art Gallery, were originally part of John Patteson's collection. Patteson had inherited many of Tillemans's paintings by his marriage into Dr Macro's family, and these now form part of the Patteson Collection at Norwich Castle Museum. Tilleman painted numerous portraits of racehorses for his patrons, among whom were the Dukes of Somerset, Rutland, and Bolton, and the Earl of Portmore. The excellent plates engraved by Js. Sympson and Jn. Lloyds, from a set of three pictures descriptive of " Newmarket Horse Races," enable us to measure Tilleman's talent as a horse painter. Equine anatomy had not yet been mastered — had been hardly approached seriously — by artists when these pictures were painted, but the "different actions and postures," to quote from the inscription on the first of the series, are rendered with a skill that shows no inconsiderable advance in the art of horse portraiture. In 1724, Tillemans worked with Joseph Goupy on scenery for the Haymarket opera house. Tillemans was also a member of the Rose and Crown Club, and in 1725 was recorded by George Vertue as steward to the Society of the Virtuosi of St Luke. Vertue noted that Tillemans was acquainted with "people of Fashion & persons of Quality" and was in demand as a painter of country-house and estate views. His country house paintings include Chatsworth House (1720s), Holker Hall, and Chirk Castle in Denbighshire (1725). In such work the houses often stand in landscapes brought to life by animals and hunting scenes. Tillemans painted several topographical works of views in Richmond and Twickenham, to the west of London, including A View of Richmond from Twickenham Park (later engraved by P. Benazech), A View from Richmond Hill and The Thames at Twickenham (known also as A Prospect of Twickenham). This last painting, the "earliest complete topographical view of the river frontage in the 18th century", was commissioned either by the poet Alexander Pope (his villa by the Thames is shown in the painting) or John Robartes, later 4th Earl of Radnor. His panorama of The Thames from Richmond Hill (c. 1723) was one of three paintings done for the Earl of Radnor. ^ a b c d Noakes, Aubrey, Sportsmen in a Landscape (Ayer Publishing, 1971, ISBN 0-8369-2005-8), pp. 47–56: Peter Tillemans and Early Newmarket at books.google.com, accessed 7 February 2009. ONDB writes: "In 1733 Tillemans retired to Richmond, Surrey, and died on 5 December 1734 while staying at Little Haugh Hall. He was buried on 7 December at Stowlangtoft church, Suffolk." Tate.org gives his date of death as 19 November 1734. ^ a b c d e f g h i j k l m Bottoms, Edward, 'Tillemans, Peter (c.1684–1734), painter and draughtsman' in Oxford Dictionary of National Biography (Oxford University Press, 2004). The first edition of this text is available at Wikisource: "Tillemans, Peter" . Dictionary of National Biography. London: Smith, Elder & Co. 1885–1900. This page was last edited on 5 November 2018, at 18:13 (UTC).